Joseph Shabalala was born in the town of Ladysmith (eMnambithi district) in the KwaZulu-Natal region of South Africa. His parents, Jonathan Mluwane Shabalala and Nomandla Elina Shabalala, raised Joseph and his six siblings on a white-owned farm called Tugela. His father died in the late 1940s; Joseph, being the eldest, had to take care of the family. He left the farm, however, in 1958 to search for work in the nearby town of Durban and works in a factory. Joseph Shabalala formed the Ladysmith Black Mambazo after series of dream just like Joseph in the Bible. 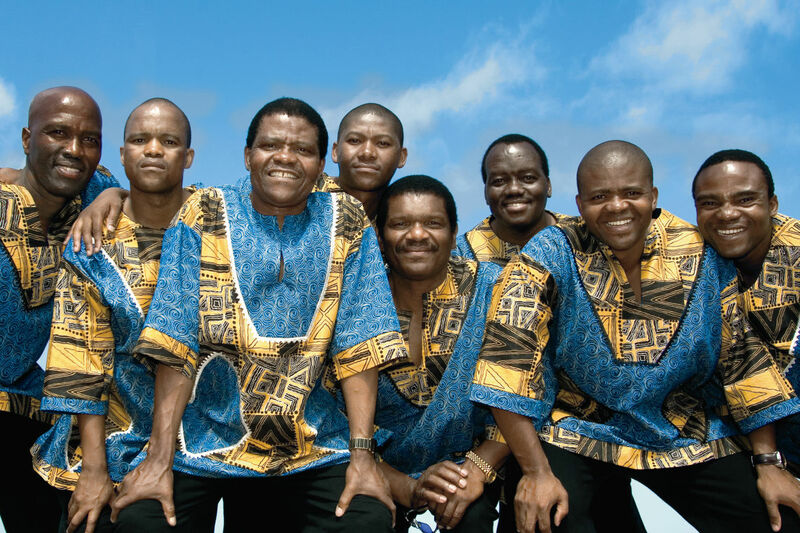 Ladysmith Black Mambazo is a musical group. The group was formed by Joseph Shabalala in 1960. They are a South African male choral group singing in the local vocal styles of isicathamiya and mbube. The group comprised Joseph Shabalala, his brothers - Headman and Enoch, cousins - Albert, Milton, Funokwakhe, Abednego and Joseph Mazibuko, as well as close friends, Matovoti Msimanga and Walter Malinga. Altogether, the group has had more than 30 different members at one point or another over the past 45 years. However, since 1993, there have only been two membership changes due to retirements. The members of the group currently reside in or near Pinetown, just outside the coastal city of Durban in KwaZulu-Natal. The chorus' members are Joseph Shabalala; his sons Thamsanqa, Msizi, Thulani, and Sibongiseni; cousins Albert and Abednego Mazibuko; and close friends Russel Mthembu and Ngane Dlamini. In 2014, founder - Joseph Shabalala, retired after over fifty years of leading his group. Joseph passed the leadership torch to his sons Thulani, Sibongiseni, Thamsanqa Shabalala, all who joined Ladysmith Black Mambazo in 1993. Joseph's sons will carry the group into the future for decades to come. The group sings of peace, of love and for people to live in harmony. They do so on every album and from every concert stage that they appear on. The group has been awarded three more Grammy Awards; Raise Your Spirit Higher (2004), Ilembe (2009) and Singing For Peace Around The World (2013) as well as nineteen Grammy Award nominations, more than any other World Music group in the history of the Awards. Currently the group has two new albums nominated; Shaka Zulu Revisited for Best World Music Album and Songs Of PEACE & LOVE For Kids & Parents Around The World for Best Children's Album. A documentary film called On Tip Toe: Gentle Steps to Freedom, The Story Of Ladysmith Black Mambazo, was nominated for an Academy Award. They have appeared on Broadway, have been nominated for Tony Awards and have won a Drama Desk Award. A favorite of the late great Nelson Mandela, Ladysmith Black Mambazo traveled with the future South African president, at his request, when he went to Oslo, Norway to receive the Nobel Peace Prize. One year later, they were singing at the inauguration of the newly elected President. After many more special appearances with the South African icon, Mandela proclaimed the group South Africa's Cultural Ambassadors to the World. Joseph took the name Ladysmith from his hometown, which lies in the province of kwaZulu Natal, halfway between the city of Durban (where members of the group live today) and Johannesburg. The word “Black” being a reference to the oxen, the strongest of all farm animals; Joseph's way of honoring his early life on his family's farm. Mambazo is the Zulu word for chopping axe, a symbol of the group’s vocal strength, clearing the way for their music and eventual success. A radio broadcast in 1970 opened the door to their first record contract and the beginning of an ambitious discography that currently includes more than sixty albums to their credit. Their philosophy in the studio was and continues to be just as much about preservation of musical heritage as it is about entertainment. The group borrows heavily from a traditional music called isicathamiya (is-cot-a-ME-Ya), which developed in the mines of South Africa, where black workers were taken by rail to work far away from their homes and their families. Poorly housed and paid worse, the mine workers would entertain themselves after a six-day week by singing songs into the wee hours on Sunday morning. When the miners returned to the homelands, this musical tradition returned with them. During the 1970's and early 1980's Ladysmith Black Mambazo established themselves as the most successful singing group in South Africa. In the mid-1980s, the American singer/songwriter Paul Simon famously visited South Africa and incorporated the group's rich tenor/alto/bass harmonies into his famous "Graceland" album – a landmark recording that was considered seminal in introducing world music to mainstream audiences. A year later, Paul Simon produced Ladysmith Black Mambazo's first worldwide release, Shaka Zulu, which garnered the group their first Grammy Award, in 1988, for Best Folk Recording.